The PWC 6th annual Low Carbon Economy Index 2014 (LCEI) tracks the rate that G20 countries are decarbonizing their economies. 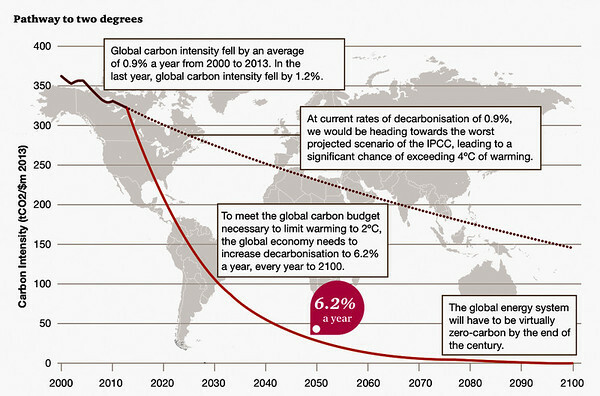 Globally we are achieving only 1% pa vs. the 6.2% pa we need to meet the 50% chance of 2°C or less. PWC has published an important contribution, very well-explained and illustrated. If you are in a big hurry, then at least look at the 2.7 minute video (with transcript). This entry was posted in Climate Change, Energy Policy and tagged Decarbonization by Steve Darden. Bookmark the permalink.